I‘m going to post this as is, I’m running out of time and there is too much things going on. If I don’t keep up I feel like I will be submerged. So, this post is not really arranged but at least it’s posted. Funny how french people made me talk! 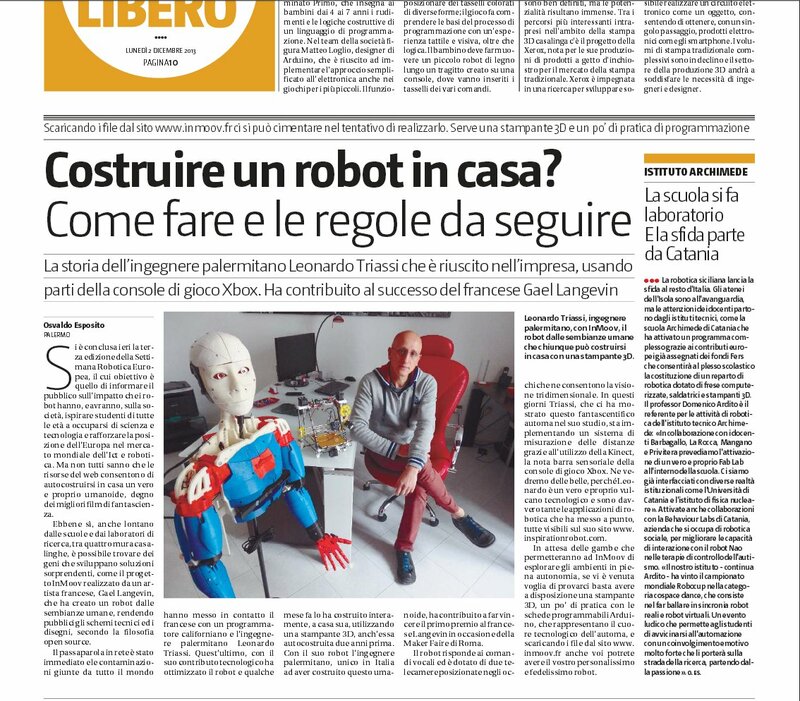 In Roma, I barely had to speak and would operate the robot almost the whole day long. In London I had to talk a lot to explain the project and I would operate the robot as well. In Paris, I just talked and explain everything over and over and barely could operate the robot. At the end of the day we were washed out! The french would approach us with caution, but once they understood we were not selling anything, the barrier was down and they were very, very enthusiast. We got good contacts and there is good chance it will bring more involvement in the near future. We tried to make pictures but somehow the light with our camera was all dark and yellow, very disappointing, there wasn’t any natural light in the show room. So I will only post others videos and pictures here. After seing my last post with the video of the hand controlled with the Leap and mostly my comment saying that they never really answered my email, they directly wrote to me saying that they apologize for what happened and so on. They propose to get closer in contact and also to feature the video on their blog, to which I responded, of course they could post the video but in exchange would they be kind to help us devellope some more applications with the Leap by sending a Leap to Grog and Alessandro, so we can work simulteanously on the process. Wouldn’t it be nice to have an App directly working for InMoov in the AirSpace of LeapMotion. Well no answer, no email, nothing. They could at least say no and give an excuse, no? Fritz wanted me to look like the robot… So I tried to be without expressions for a few seconds, Inmoov wins at this game. Joel Hacket went to the mini MakerFaire of Sydney Australia. You said mini? It seems to me like it was huge. Apparently a success. As you can see InMoov is using his jaw when he talks. 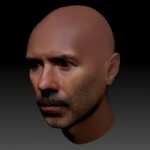 Well this is script Joel has created and it is now available as a service in the InMoov service of MyRobotlab. It works using text to speech, so any commands added will automatically be said by the robot using it’s jaw. This is the hangout done with MAKE during the Robot Hack. Luckily Greg Perry was present, somehow they finally asked him to be on air only the previous day, I was totally surprised when I realised they didn’t get in contact with him, so I expressively wrote to them, that it was very necessary to have Grog with us. Stuart Gannes, Mike Senese animated the hangout, Chuck Fletcher was present and also did some demonstrations with InMoov. All together it went pretty smooth. 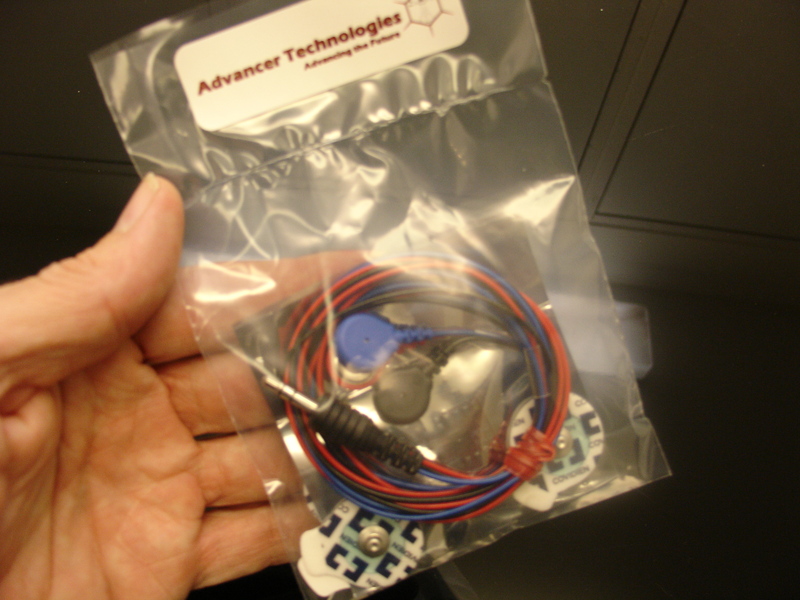 I received the sensors from Advancer Technologies. As I said in the previous post, they kindly have sent a pair of the sensors. I already have spent a full day with the sensors glued to my arm making all kinds of tests. 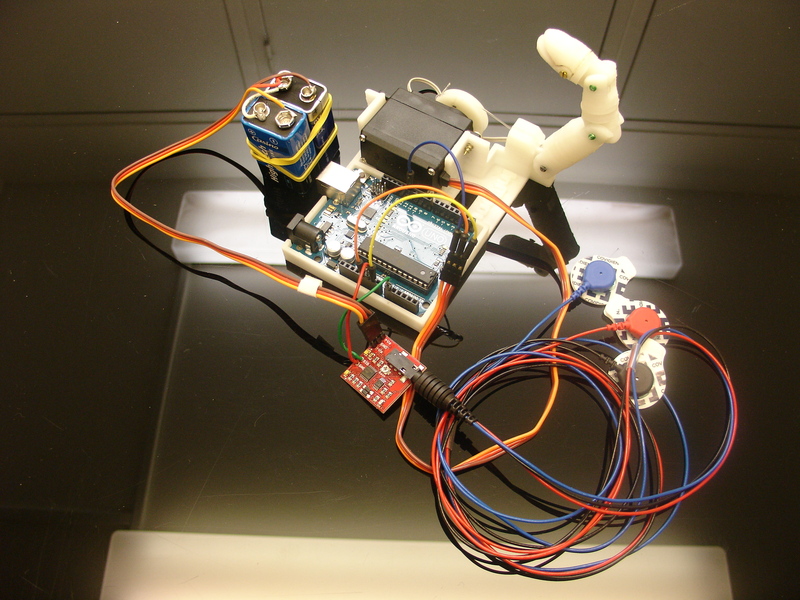 Mainly my difficulty for now is to write an Arduino sketch which will make the finger respond to my muscle. One of the tricky part, is that the sketch has to be working with a DC motor with driver and not a servo. Any help is welcome, just write me an email or comment the post. Using the finger starter is great for this kind of tests. 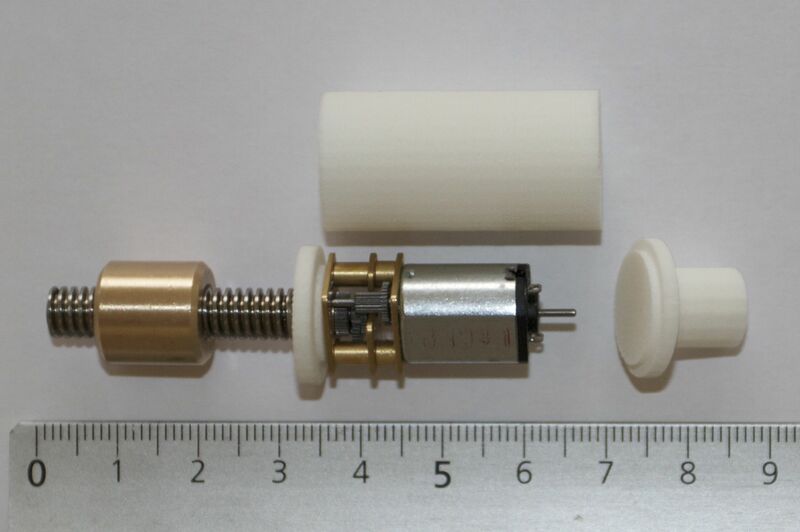 But, ultimatly, the sensors will be controlling the DC motors. See the prosthetic post with the new hand design. 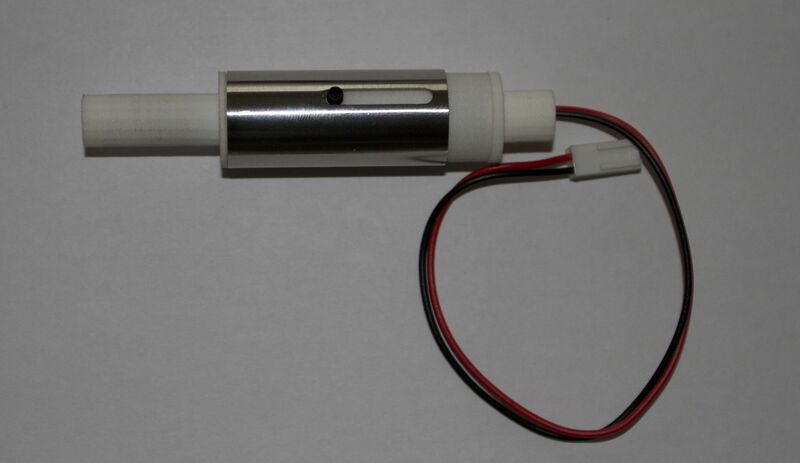 Gilles, a french builder I met in Rennes, has sent me a little DC motor mounted on a actuator. The principle is different compared to what I have been working on for the new hand, and I need to make some tests with it. He has sent me a whole assembly notice. Very kind. What is nice about it, is the small diameter of the motor and the idea is working as a piston instead of a bevel gear like my design. There is also an encoder at the rear of the motor which somehow simplifies the connectics. 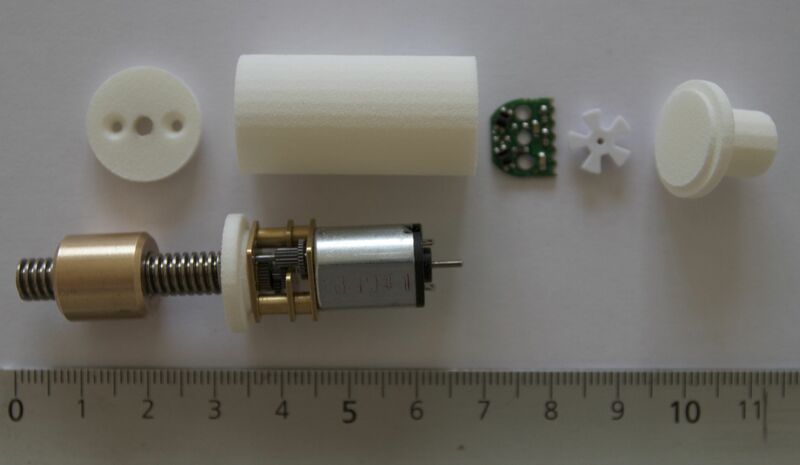 The downside is the precision of the parts, they are small and it will be difficult to be done on our home 3D printers, so it would need to be professionaly printed. Another thing is that I would need to review most of what I have designed in the palm already and also the way the fingers would be actuated. Instead of working on the legs, I went on the stomach. As I said since the beginning of this project, it has to be fun for me. So when I don’t feel like working on something, I just work on something else. The legs worries me somehow, I still don’t see how I will construct the hips attached to the stomach. 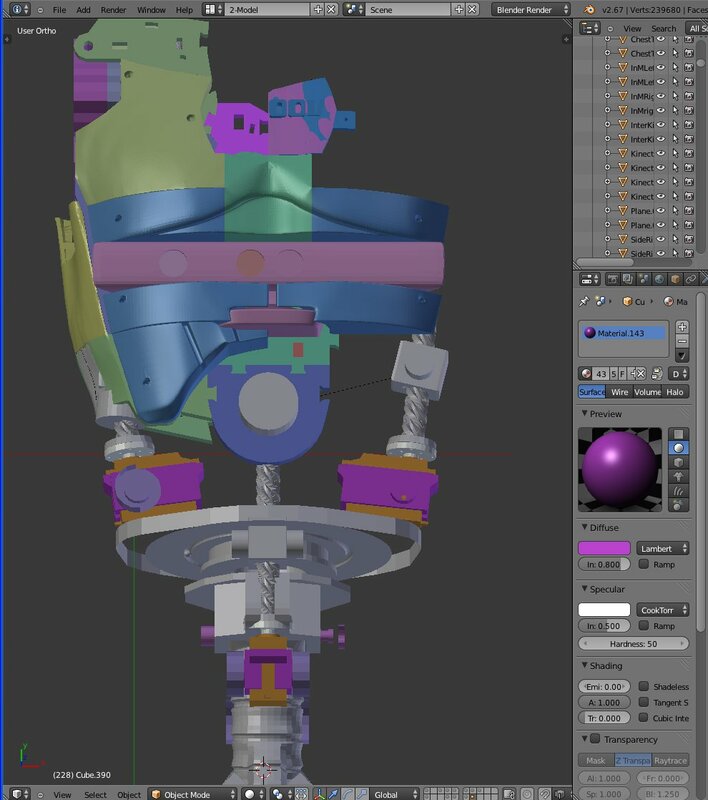 So jumping on designing the stomach is also an interesting part because it will allow most of the builders to just add the parts to what they already have printed. Here is a quick view of what I have done for now. The servos I plan to use in brown have a 40kg Torque and they also are Hobby servos. The robot will be able to lean forward, sideway and also rotate the whole torso. This is going to be cool when InMoov will have to pick up the broom in my workshop. This entry was published on December 5, 2013 / Gael Langevin. Posted in finger starter, jha, leonardo, servo, Uncategorized and tagged 3d print show, carrousel du louvre, clubic, fritz, jaw movements, leap, letsmakerobots, paris. Bookmark the permalink.